Possibly the healthiest -- and easiest -- dessert treat ever! Preheat the oven to 350 F. Wash and core the apples (I used a vegetable peeler to cut and scoop out the core). Place a few pieces of walnuts at the bottom of each apple cavity. In a small bowl, combine all the remaining ingredients, then spoon into each apple cavity, and top with a few walnut pieces. Place in an oven-proof dish and bake 30 to 45 minutes (30 for firm but cooked apples, and up to 45 for soft, melt-in-your-mouth apples). Top with a drizzle of honey and a sprinkle of cardamom. Serves 3. This is SO perfect for me....I love oats and apples together...and with the ginger and walnuts, I bet it`s delicious. Thanks for the recipe. 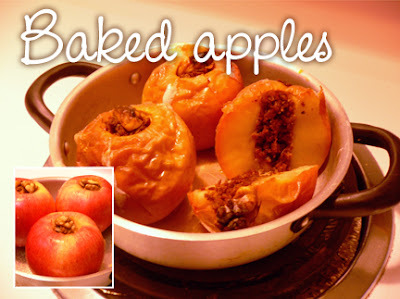 Those baked apples look good!